Need to get a car seat for 1st grandchild but know nothing about them! Would I need a separate Isofix base unit for this? Nice seat. We have 2 in red for both our girls. Can find fairly regularly at this price but heat from me. Brilliant price considering my daughter made me buy her one for £25!!!! Superb seat bought two of these 4 yrs ago and still going strong. This is a great price for a great seat! Worth trying in your car before ordering though, the chest pad can cause the belt not to extend and retract properly in some cars. Much appreciated u'r help. Thank you and have a lovely weekend! Does anyone know where to get replacement covers for these? Does it rotate so the kid can be removed easily? 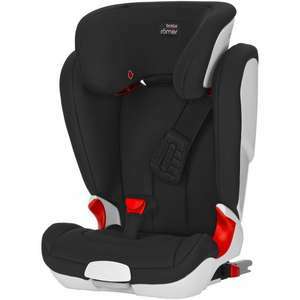 Best price for non isofix / seatfix model. Other places selling for 99.99 Going through Quidco you can get 5% cashback. That test information is a great resource. I actually use ADAC for breakdown cover as they are cheaper than any UK company and they cover all of Europe. I also know German fluently! Just so happened to live there for a few years when my Father was posted there with the Army. totally agree. Wipes out the middle seat and i drive a large car. Great seat though! Nice if I hadn't have picked up the star wars maxi a few months ago in Halfords I would have gone for this. I have the almost identical isofix version and it’s great. Really wide is good for crash protection, but bare in mind not ideal if you want to carry an adult in the middle seat. We bought one of these from amazon for out little one and found it very good when putting her to sleep. For us it cushioned her so we think she felt like she was still being held when put down. Agree with comments though, does need to be used under supervision and as per manufacturers guidelines. Also worth mentioning these come with i think a lifetime guarantee from the manufacturer, you need to sign up through the website address on the packaging and your original order details and then they allow you to print of a guarantee certificate in case you need to claim. They've not been recalled as far as I'm aware although they seem to be taken off the shelves of some shops every time an old US safety study circulates round the web. If you read into the detail there's been problems when parents haven't been using them per the instructions (ie for young babies that cannot fully roll over yet place them on their back in the middle), for instance one parent used it to prop her child up on it's side because she couldn't get her to sleep on her back (she propped it up on it's side?!). I know it's insensitive but that and the other examples from the study seemed like parent error. In my own experience if I want to put the baby down somewhere for a bit around the house they're great (good quality, handy, designed to avoid flattening their head etc), but use common sense. My daughter was 6 when she moved out of a rear facing seat and into a hbb. It's safer to keep them rear facing as long as possible. She’s not bored, she has a view out of the back windscreen instead of having to look at the back of the passenger seat. She has older siblings aged 12 and 9 who are forward facing so she can interact more easily with them than if she were forward facing (much like a couple going out for a meal - you don’t sit side by side do you, you sit opposite each other). We also have pop-up seats in the boot space, so on the odd occasion those seats are in use she can easily talk to whoever is sitting back there. But aside from all that, even if she were bored witless she would have to put up with being bored I’m afraid! She’s very good on climbing frames and at balancing as it happens, I’m happy to let her make her own choices and take risks in that respect, but in terms of how she sits in the car it’s a safety issue that she has no say in whatsoever! Child car safety is a bit different than let them have fun on a climbing frame! Food old false equivalency argument there! I'd rather have a bored toddler. Plus, my order from Uber Kids came with: Side Window Sunshades (44x36cm) Pair... Bonus FREE! Cheers for this. I've been considering one recently for my 3 year old (she's not ready for it, but is getting close to it) and at this price I don't mind getting it a few months early. I have shortlisted this seat down to this and the Recaro nova 2 booster both are really good. Code doesn't"t work for me .. Ordered last night - thanks op and qqq1234. When did people get email confirmation? Every Stage FX (with ISOFIX) for £175. Please do share details! It's around £250 in most places! Yes, once the child weighs 18kgs you remove the harness and use it as a high backed booster. The manufacturer says 12 years because that's what the law states - a child must be in an appropriate car seat until they are 135cm tall OR 12 years old. In reality hardly any 12 year olds are likely to still be smaller than 135cm, so you won't actually see a 12 year old using it. It is out of stock, try adding to basket. It isn't out of stock now maybe they added some? Lol, top notch trolling, well done! Car travel is not safer than flying - very far from it. Saying fact after a ludicrous statement does not make it true. Mile for mile plant travel is by far the safest form of transport. Car travel is statistically one of the most dangerous. The direction of seats in planes is largely irrelevant in this argument as plane crashes typically involve speeds of 300mph+ You are however much more likely to survive a train crash if you are rear facing. I don't really care what decisions people make with regard to their own children's safety but I think people should be aware of the facts. Unfortunately most people are totally ignorant of the fact that rear facing is safer and therefore can't make an informed decision. ​Hi I agree too . I wouldn't put a in 9mth in this carseat. mine are 4 yrs and 6yrs. Unfortunately the new model is a different design so does not fit my car. This carseat may only be the older model but is still safer than alot . (New stock only made 4mths ago) The head rest has 3 heights but if you take off the bar on the headrest it has lots more heights for growing child as I thought it was odd to only have 3 heights but I googled it and found out it has several more . I voted cold, and certainly wouldn't consider buying a Nania seat, but I voted cold because: - This seat has been available for many years so won't have the newer safety features. 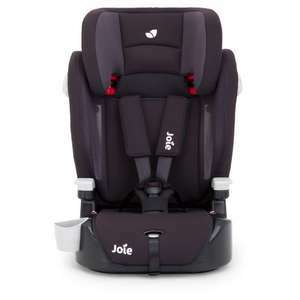 - For a younger baby it has a very small recline angle. - The height adjustment options on the headrest is just 3 options for the headrest height as a high back booster. - It is quite a narrow seat for a 3 /4/ 5 year old unless they are quite a slim build. 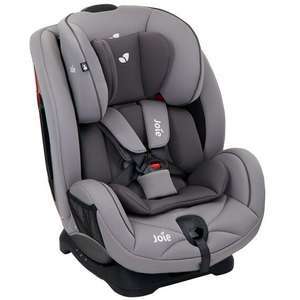 The Recaro Young Sport Hero is the newer model and well worth the extra in my opinion at £165 or the joie trillo shield (£79 in argos) has more up to date safety features too for similar age group (Though I wouldn't put a 9 month in any of them). Have got the storchenmuhle starlight branded version of this and it's a fab seat. wouldn't want to put a 9 month old in it but eldest used it as a spare in grandparent's car from about 18/20 months and her 3 year old brother now using it. Good safety reviews and comfy. The cold voters are undoubtedly the Nania seat purchasers! is that one with isofix or not? I'd thought about it in black for a while, figured something might come up for Black Friday and I'm glad I did. Red is much better. Ordered thanks. My first HUKD purchase, thanks! I can't find a better product or price anywhere. You also get a FREE car seat protector and FREE window sun shades! Great price for this car seat, the kids will love it too with their favorite characters on. Free delivery or express delivery available. Does anyone have these? Are they good quality/safe? Reviews seem mixed online.